Quantum chemical descriptors such as molecular orbital energies (HOMO & LUMO) and atomic net charge. Molecular descriptors can be acquired from experimental data or through computational chemistry calculations (in silico). The compounds used to build the mathematical models are often congeners. QSAR studies involve statistical methods for studying the correlation between activity and molecular descriptors and also for assessing the reliability of the mathematical model. The ultimate goal of QSAR modelling is essentially to use the constructed mathematical model to predict the biological activity of test molecules. Able to predict activities of a large number of compounds with little to no prior experimental data on activity. Can reveal which molecular properties may be worth investigating further. Regarded as a “green chemistry” approach since chemical waste is not generated when performing in silico predictions. In vivo and in vitro experimentation can be very expensive and time-consuming. QSAR modelling reduces the need for testing on animals and/or on cell cultures and saves time. Does not provide an in-depth insight on the mechanism of biological action. Some risk of highly inaccurate predictions of pharmacological or biological activity. 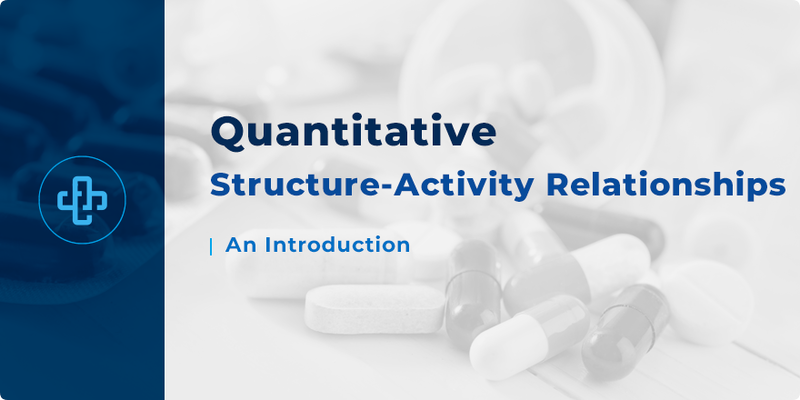 Quantitative structure-activity relationships (QSAR) can be used during the drug design and drug discovery process. QSAR models can be used as a screening tool to test a large set of compounds or for eliminating test compounds which do not show promise in terms of predicted biological activity. QSAR models have been incorporated in computational tools for the prediction of skin sensitisation and activity towards human ether-à-go-go related gene (hERG) K+ (potassium ion) channels. [3,4] The latter is associated with cardiotoxicity (see below). Several drugs such as sertindole (antipsychotic) and terodiline (muscarinic antagonist) have been withdrawn from the market in many countries due to concerns regarding cardiotoxicity associated with hERG K+ channel blockage. 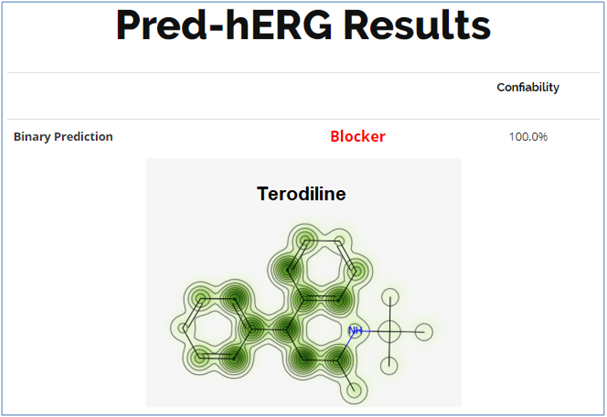 Pred-hERG is a free computational tool, developed by Andrade et al, that incorporates QSAR models for predicting hERG K+ channel blockage and hence potential cardiotoxic properties of molecules. From a drug design and discovery perspective, tools such as Pred-hERG are useful since it can provide insight on the potential cardiotoxicity (or lack of) of potential drug candidates. (1) Toropova, A. P.; Toropov, A. A.; Martyanov, S. E.; Benfenati, E.; Gini, G.; Leszczynska, D.; Leszczynski, J. Chemom. Intell. Lab. Syst.2012, 110 (1), 177–181. (2) Gonella Diaza, R.; Manganelli, S.; Esposito, A.; Roncaglioni, A.; Manganaro, A.; Benfenati, E. SAR QSAR Environ. Res.2015, 26 (1), 1–27. (3) Braga, R. C.; Alves, V. M.; Muratov, E. N.; Strickland, J.; Kleinstreuer, N.; Trospsha, A.; Andrade, C. H. J. Chem. Inf. Model.2017, 57 (5), 1013–1017. (4) Braga, R. C.; Alves, V. M.; Silva, M. F. B.; Muratov, E.; Fourches, D.; Lião, L. M.; Tropsha, A.; Andrade, C. H. Mol. Inform.2015, 34 (10), 698–701.